This is what is going on in NSW schools at the direction of the Evangelical “JESUS” campaign run by the Bible Society. Young children are being sent home with a bracelet to remind them of sin and redemption and how to get to heaven. This Unit contains six lessons, lasting approximately 30 minutes, for children. 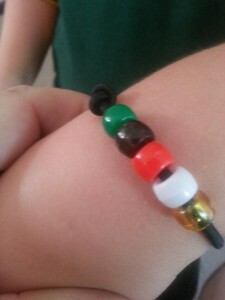 The lessons go through six main points of the Gospel, and include the making of wristband or necklace with coloured beads to symbolise each main point. Green Bead: God’s Creation – God created everything, and everything he made was good, beautiful and perfect, including man and woman. Black Bead: Sin – Something went very wrong! Mankind disobeyed God, which is sin. Darkness entered the world, and things weren’t perfect anymore. Red Bead: Jesus Died – God’s love fixes the problem. Jesus died on the Cross to take away Sin. White Bead: God Forgives – God Forgives all who Trust in His Son Jesus. Blue Bead: The Holy Spirit – Jesus sends the Holy Spirit to live in all who love and trust Him. Yellow (Gold) Bead: Heaven – God prepares a place in Heaven for His people to Live with Him forever. This folks is WHAT IS BEING TAUGHT IN YOUR SCHOOLS. Head over to our Facebook site to have a look at the post and more than 60 comments from outraged parents. Click below to view and download the complete lesson. It is one thing to tell children about religion in schools, but this goes way beyond that and has no place in a school – this is full on “get ’em young and tell them about SIN”.